Wall coverings vary in material and durability. The most common are wallpaper, wall textiles, and plastic wall coverings. Plastic wall coverings use either a paper or fabric backing that is laminated to a solid plastic decorative surface. In some cases, textiles and wallpaper can be coated with plastic vinyl to increase the longevity of the material. Some homeowners choose to use specialty wall coverings such as wood veneer, laminate, or tile. Areas that experience a lot of moisture like a bathroom will often be covered with tiles made out of ceramic, stone, quartz, or glass. Other specialty wall coverings exist but are rare in residential housing. Wood veneer and laminate coverings tend to be more expensive and can have high levels formaldehyde. Wood finishes can also off-gas VOCs into your home. If you are using tiles, make sure they are manufactured in the United States and use low-VOC adhesives for installation. Imported tile may have high traces of heavy metals such as lead. Plastic wallcoverings can be categorized into two types: vinyl and non-vinyl. The main component of vinyl wall coverings is a plastic chemical called PVC, or polyvinyl chloride, while non-vinyl wall coverings use plastic alternatives that do not contain PVC. Vinyl wall coverings can release fumes of vinyl chloride, a known human carcinogenic, into the home. Exposure to high levels can be fatal and longer-term exposures to low levels have been linked to toxicity in nearly every major organ system. Studies show that the main source of indoor VOCs and formaldehyde in homes is PVC wall coverings, rather than new furniture or flooring because it has a surface area that is three to four times greater than that of the floor. These chemicals lead to asthma, skin and eye irritation, and cancer. The Ecology Center tested thousands of vinyl wall coverings and found that more than half contained one or more harmful chemicals in sufficient quantities to cause concern. Phthalate plasticizers are added to PVC to make it soft and easier to install. Studies have linked phthalates to reproductive, developmental, and respiratory health problems in people who have prolonged exposure. Additionally, some phthalates are known carcinogens and have been identified as likely asthmagens. A study of adults in northern Europe working in rooms with plastic wall coverings found the workers were twice as likely to develop asthma. Due to their chemical structure, phthalates migrate off products into dust and onto occupants, especially children who more frequently are touching the walls. Phthalates were deemed dangerous enough to be banned in children’s toys by the U.S. Consumer Product Safety Commission but have yet to be regulated at all in building products. Another health concern is the use of heavy metal stabilizers. After lead was banned it was replaced by another dangerous compound, organotin stabilizers. A 2010 study by the Ecology Center found more than 40 parts per million of lead, antimony, and cadmium in the tested PVC wallpapers. Imported and older stock PVC products in particular can have dangerously high levels of toxic metals. The high plastic content found in both vinyl and non-vinyl wall coverings makes it highly flammable. To reduce fire risk, manufacturers treat wall coverings with halogenated flame retardants. Even textiles, wallpaper, and tiles can be treated with flame retardants. These chemicals have been linked to thyroid disruption, reproductive and neurodevelopmental problems, immune suppression, and cancer in animal studies. Wall coverings are applied using an adhesive. Types of wall covering adhesives include clear, wheat based, clay based, and vinyl on vinyl, which is used to bind together two vinyl surfaces. The first three are water based, and thus healthier; the adhesive for securing vinyl on vinyl tends to have higher levels of VOCs. Most wall covering adhesives contain biocides to fight mold and bacteria. Biocides are classified as PBTs or toxic chemicals that do not break down in the environment and build up in concentration in the food chain. They are known to disrupt endocrine functioning. Wall coverings also can be sold with “Peel and Stick” adhesives already attached to the backing, similar to double-sided tape. This type of adhesive is popular for DIY installation and is a less toxic alternative to wet applications. 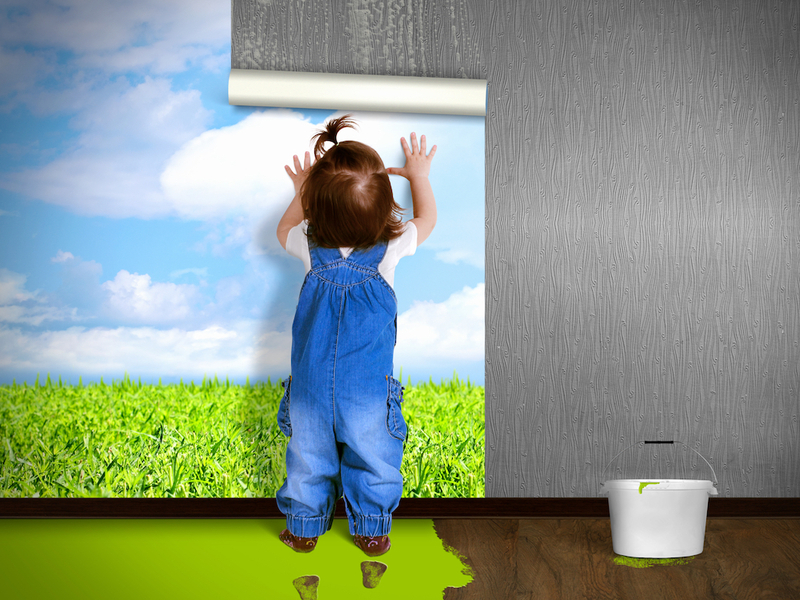 A study by the National Institutes of Health found that replacing vinyl wall coverings with environmentally friendly options such as plant- or silica-based materials reduced formaldehyde levels in ambient air and decreased skin irritation, especially in children. While natural wall coverings are safer, they tend to be more expensive. If they are unaffordable, at a minimum avoid purchasing wall coverings that have flame retardants and antimicrobials. Opt for PVC-free plastic whenever possible.